A German colleague brought these into work the other day. The humour works on just so many levels I’ll just leave it up to you. This problem beat me about the head for most of yesterday until I worked out that PHP 5.0.5 doesn’t actually know about Oracle 10. 8 and 9, sure thing – otherwise it decides it is an older version (very silly). The other problem is that when PHP tries to link to the oracle client libraries, by default it attempts to link against the 64 bit libraries – which with PHP being a 32bit app just isn’t going to fly. So here I will attempt to guide you in all that is good with PHP and Oracle 10.
installed. As this was to be an actual server machine I installed the full database server including client libraries (which happens by default when you install server). However the purpose of this is not to help you install Oracle – there are plenty of guides out there for that. This is to help you get PHP compiled in this environment – there are no guides for that. We need to tell it where to find the oracle libraries. This will enable configure to complete. No amount of adding –includedir= and –libdir= on the configure command will result in make doing the right thing and linking against the lib32 version. The solution? We need to edit the configure script to tell it that lib isn’t the be-all and end-all of oracle libraries. This is a pain, I know, but hopefully the PHP people will fix this for 5.0.6 and above. cd to your database and rename the lib directory to lib.unused temporarily so that PHP cannot link against it and leave the lib32 one as is. Switch back to php dir. Run your configure command, make (which should now complete) and make install. Go back and rename the lib.unused back to lib as other things will need this to exist. Your PHP should now be working fine. Note to PHP developers if they read this – this patch is not one that can be dropped into the regular build – it will only help people who have difficulty installing PHP with OCI8/Oracle10 on Solaris10. I hope this proves useful to others – it took me >24 hours work to get to this point. The Internet casino and poker house GoldenPalace.com bought up the only known deed for The White House as reported by The Inquirer. Except that the link that the inq uses to get to the page telling the story at casinocitytimes.com revealed a little more information than they should have. Because the URL on the inq was mistyped – they tried to make two links but only made one broken one. When I clicked on the link: http://www.casinocitytimes.com/news/article.cfm?contentID=153470%5D %20and%20here%20[http://realtytimes.com/rtcpages/20050831_titleinsurance.htm I received an error page that was obviously the result of an unchecked contentID being passed right from the url into the SQL. This is a classic case of unchecked user supplied data being trusted which leads to a compromise in security and some very red faces when some naughty people get hold of it. I hope they fix it soon. When combining sessions with HTTP Auth in order to maintain state. The difficulty surrounding HTTP Auth is that even after you "logout", the browser will continue to send the correct username and password with each request. Thus immediately logging you back in again – unless you use the states to keep track carefully. In order to use this to protect any page you need to copy the auth.inc.php file to your server and then simply include or require it in any page. You may wish to set the variable $HTTP_AUTH_REALM to a string before including this as this will change the Basic Realm information in the auth dialog box to a string of your choice. You should also look at the checkpw() function and replace that with something that will check your user credentials correctly. Input is username, password and it should return TRUE or FALSE if the credentials supplied are OK or not. A working example is provided over in my projects section, the default username is "paul" and password is "gregg"
I hope this code serves as useful learning material. Good luck. Freedom of Information, Request #1, The reply. 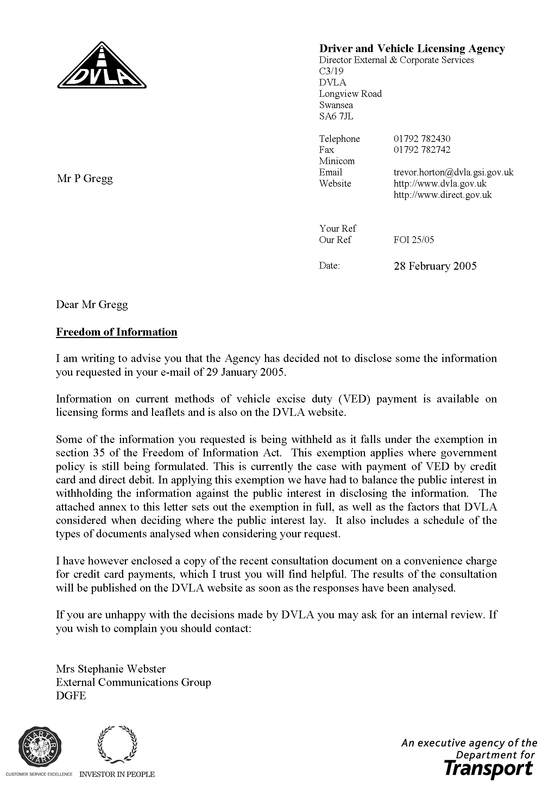 It was remiss of me not to follow up on my earlier FOI post (thanks Tony for the prompt). Rather than just post the reply as a comment to that post (it’ll never be seen), I will post it here. Basically they decided to withhold the information as it pertains to current policy discussion.